An impressive tower of the fort of Nakhal (Nakhal Fort or Nakhl Fort) illuminated by warm evening light below a blue sky. 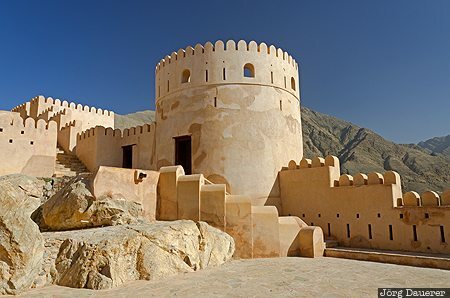 Nakhal is in the Al Batinah Region in the center of the Sultanate of Oman. Nakhal is in Al Batinah, Oman. This photo was taken in the afternoon of a sunny day in March of 2012. This photo was taken with a digital camera.